The use of family trust has always been a very popular planning tool to achieve several legal and tax objectives. One of the most common use of a family trust has been to enable income splitting with other family members that are in a lower tax bracket. With the recent tax changes on split income (TOSI), some might ask themselves, is using a family trust still a viable option to income split, or is the current trust structure in place still useful to them? The answer is that even though the new rules that came into effect January 1, 2018, does limit our ability to income split using a family trust, they are still acceptable methods that we can use to achieve that goal. In the above example, a family friend creates a trust (using a collectable coin) where the parents might be the trustees (the decision makers) and where the parents, children and other corporations such as a holding would be the beneficiaries of that trust. Every year OPCO would declare a dividend to the trust, then the trustees would decide who would be the recipient of those dividends among the list of beneficiaries, then the beneficiaries would tax themselves on those distributions. The new TOSI rules were created to eliminate the benefits of income splitting with family members by taxing split income such as dividends at the highest marginal tax rate in the recipient hands unless it falls within one of the exceptions. In our example, all dividends declared by OPCO to the trust and then distributed to any family member could see TOSI applied to that dividend unless an exception applies. During another tax update we had discussed some of the potential exceptions that could apply. Briefly, here are the three main exclusion that are important to consider when looking at a family trust setting. When the dividend that is paid from OPCO to the family trust is then distributed to a beneficiary who is active in the company, then the dividend could fall within the “excluded business” exception and TOSI would not apply to that dividend maintaining the opportunity to income split. The easy way to fall under the excluded business exception would be to have worked 20hrs a week for the year or 20hrs a week for any 5 previous year for OPCO. Another way to avoid TOSI would be to fall under the “excluded shares” exception. For this exclusion to apply, the beneficiary must own directly 10% of the voting rights and 10% of the value of the corporation. The corporation must also not be a professional corporation (ex: doctors, lawyers, accountants, etc.) and almost none of its income must come from providing services or from related corporations. Therefore, the use of a family trust would not work in this situation because a beneficiary cannot own shares directly into OPCO by using the family trust. 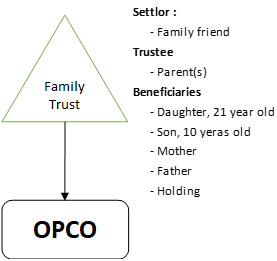 In the circumstance that no other exceptions can be applied to avoid TOSI and that OPCO sources of income are not from services or from related businesses, then planning could be done to have the trust distribute 10% of the shares it owns in OPCO to a beneficiary on a tax deferral basis. But in order to do so, we have to be comfortable losing control of that 10% of the votes and value of OPCO. As a last resort for exclusion to TOSI, there is the “reasonableness test”. If the total amount of distribution that the beneficiary of the family trust received is deemed to be reasonable for the type of work and contribution the beneficiary did for OPCO, then TOSI could be avoided. A reasonable test is not an ideal way to try to avoid TOSI as it is up to interpretation of what is and what is not considered to be reasonable. Dividends are not the only form of income splitting that a family trust can help accommodate such as splitting capital gain on the potential sale of the shares of OPCO could also be very effective, even today. The sale of shares of a qualified small business corporation “QSBC” will be excluded from the application of TOSI on the potential gain when dealing at arm lengths. QSBC shares are shares of Canadian private corporations that meet a certain holding period criteria as well as total active assets on total assets threshold. Because of the active asset threshold, a holding corporation in most cases will never be able to qualify for this exception, but an operating company properly structured using a family trust should be able to qualify. Taking our example, if OPCO starts accumulating excess cash, we would want to move that excess cash to the trust by means of dividends, then from the trust to the holding corporation who is also a beneficiary of the trust. The holding corporation can then reinvest the cash into passive assets (ex: quoted shares) while OPCO will remain eligible for the QSBC exception if ever a future sale were to happen. A second important use a family trust in regards to using the TOSI capital gain exception on QSBC shares will be the multiplication of the lifetime capital gains exemption with all the beneficiaries in the trust regardless of age. In 2018, the lifetime capital gain exemption is currently at $848,252, therefore when selling shares of a qualified small business, the first $848,252 will not be taxable. If the trust owns 100% of the common shares of the corporation, then it is possible to use every beneficiary’s lifetime exemption in order to cover most or all of the sale price. For example, if our family trust owns 100% of OPCO and OPCO shares is sold for $3,000,000, the total tax could be $0 if we have 4 individual beneficiaries in the trust, father, mother, son (minor) and daughter, making it $848,252 x 4 = $3,393,008 of available lifetime capital gains exemption. If, in the same scenario we did not have a family trust but instead the father owned 100% of the shares in OPCO, TOSI would still not apply to the father, but the total tax liability assuming the highest marginal tax bracket in Ontario, could have been approx. $576,000. Another popular way to income split in the past was implementing a prescribed rate loan structure. Prescribed rate loan planning involves the high-earner to loan money or assets to a trust established for the benefits of family members who are in lower tax brackets. In order to avoid the application of the attribution rules, the loan must bear interest of at least the CRA’s “prescribed rate” of interest, currently at 2%. The prescribed rate is set by CRA quarterly and is tied directly to the yield on the Government of Canada’s 90-day Treasury Bills. The trust, who is the borrower, can then invest the funds received and earn taxable income which in turn will be redistributed to its beneficiaries. In order for the loan to remain exempt from the attribution rule, the trust must pay the lender the annual interest on or before January 30 of the following year. Therefore, the true tax saving from this strategy lies in the difference between the prescribed rate loan and the rate of return obtained from reinvesting the loan. The prescribed rate loan is set at the time of the loan. Once the loan is made, the rate is locked in, protecting you if ever the rate were to go up in the future. The new TOSI rules might complicate this type of planning in certain situations. Let’s say the trust takes the loan and decides to start a business, while the lender remains as a trustee of the trust (in order to maintain some form of control). Then TOSI could apply to the trust distributions, because the trust would be exploiting a business and the trustee, who usually would be related to the beneficiaries, would be involved in running the trust and its decisions. One simple exception still remains: investments in quoted shares and mutual funds. The kiddie tax and TOSI rules do not apply on income derived from quoted shares in the stock market or the investment in mutual funds, which means income splitting might still be attainable with a spouse or children of any age. If, instead of having the trust using the loan to start a business, it was to reinvest the loan in an investment portfolio made up of quoted shares and mutual funds, it should be able to continue to income split between family members. Here is a simple example of how a prescribed rate loan might work and the potential tax savings :M. X is a single father taxed at the top marginal tax bracket in Ontario (53.53%), with one child aged 14 and no other source of income. 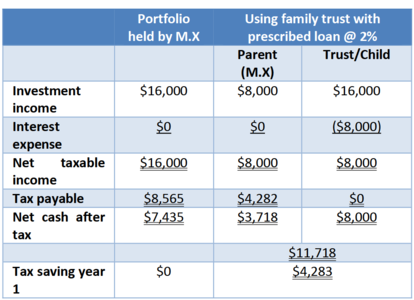 M. X loans $400,000 to a family trust at the current prescribed rate of 2%, where the trust reinvests that money into a portfolio earning. With the recent changes to our tax system, family trusts still have an important place in corporate and personal tax planning. There are other reasons why using a trust could be beneficial apart from income splitting, such as estate freeze where one could freeze the value of a corporation in favour of a family trust in order to either do succession planning or for estate planning, such as planning for the terminal income tax liability. But using family trusts also has a few potential downfalls, such as trusts has a lifespan of only 21 years, there are additional set up fees and yearly fees associated with a trust, as well as potential yearly tax filing requirements. That is why it is important to evaluate all factors when deciding whether or not to implement a family trust in your structure and these are things we navigate through with you to see if using a family trust is appropriate for your situation. We can see that we are achieving $4,283 in tax savings using this strategy every year. After 10 years, the total saving could be $42,830. CAUTION: All income taxed to the children’s tax return must either, be paid to, payable to, or applied to the benefit of the child. CRA has been cracking down lately on these types of transfers. They want to make sure that if a child received income, that the income does not simply automatically gets transferred back to the parent afterwards. The income received by the child can be applied towards private school, university and college, summer camps, family trips, groceries, etc. Good record keeping is a must in order to implement proper safeguard against CRA’s questions. This warning is applicable to all income splitting strategies.